Being a utilitarian and also an enthusiast of retro-industrial style? Are you still using the monotonous bulbs to light up your restaurant, bar, workshop, office, kitchen, living room and bedroom? However, it is time to have your Oak Leaf Pendant Light Shade to spice up your home, adding warm and welcoming feeling to your restaurant. Industrial Ceiling Light is a necessary lighting option and makes great places for you. 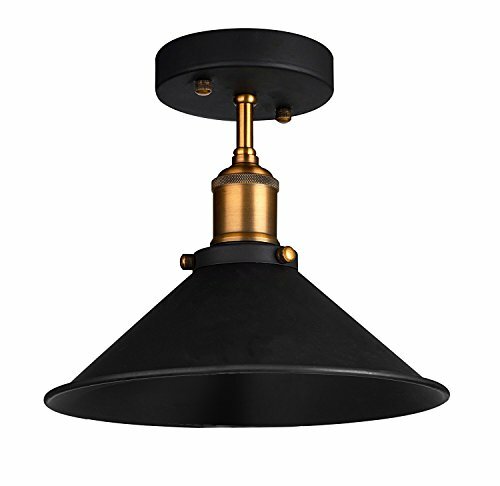 Bring you back to 19-20th century: Black canopy, brass cap and semi flush mount, all of which make this pendant lighting a perfect décor for your house and office. What's worth mentioning, it will not conflict with any modern elements. A full mounting kit for easy installation: Oak leaf Semi Flush Mount Ceiling Light comes with a black canopy, metal base cap, mounting plate and other accessories. But you may need some hardwiring work to finish the installation. Recommended use: Indoor ambient or mood lighting in kitchen, dining room, bar counter, hallway, entryway, home office, etc. (Recommend to go with wood wall or wooden decors). 1. Do not switch on before assembling. 2. If you want to change the bulbs, please switch off and after the bulb is cold. Note: BULB is NOT INCLUDED in this package. Base E26 bulbs (Edison Bulb recommended) are available at Oak Leaf, bulb ASIN: B01B17LIRE, B01DK0NIR8. A PERFECT MATCH WITH INDUSTRIAL STYLE: The contrasting mix of matt black and brass accent adds a retro and rustic favor to this Industrial Pendant Light, making it a perfect decor for your industrial style house and office. A VERSATILE LIGHT FOR VARIOUS SETTINGS: A common use of this Vintage Hanging Light Fixture is to hang it over the kitchen sink. Besides, it's ideal for using in hallway, entryway, bathroom, dining room or your bar for ambient or accent lighting. A CONVENIENT INSTALLATION PACK: This Semi Flush Mount Ceiling Light kit comes with everything you need to install (Canopy, brass covering cord with metal base cap, screws.) It's suitable for E26 bulb and takes you only about 10 mins to get the job done! DECENT SIZE AND BRIGHTNESS: Oak Leaf Mini Pendant Light Shade comes with a relatively small but still decent size (Diameter: 260mm/10.2'', height: 220mm/8.66'') for both your space-saving and decorative needs. Instead of blocking the light, the black shade makes the light more focused for small area lighting. OUR CUSTOMER MONEY-BACK GUARANTEE: With its metal cover, this Light Shade is well-made and sturdy. If you are not satisfied with the Oak Leaf Industrial Ceiling Light, just return them within 30 days for a full refund. No questions asked, no hassle. Click the Add to Cart button to have your light shade shipped today.